What DNA tests do you require when you buy a bull? Parentage? Genetic Defects? Polled? Coat Color? What trait is most important in bull selection? Does genomic testing provide value? Donnell Brown currently markets 4 different breeds (Angus, Red Angus, SimAngus and a 4-breed composite called Hotlander™). Brown has been involved with 17 different breeds. They DNA parentage test every animal born on their place. Five to ten percent of animals have the wrong parentage assigned. Cows swap calves. The wrong straw gets pulled out of the tank. A bull comes over from two pastures over and then goes home before we ever knew he was out. Would we prefer to use a bull with one calf crop or a bull with no calves? Most producers prefer the bull with more data. 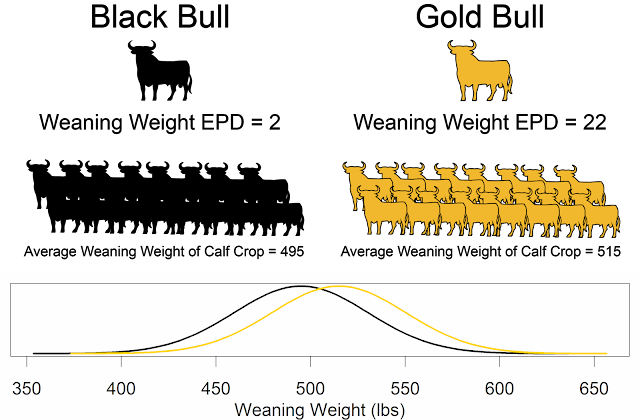 Genomic-enhanced EPDs provide the same amount of information as the first calf crop out of a bull. Donnell said for seedstock producers it is more important to DNA test females, because that gives us more information on her genetic merit than her lifetime worth of progeny data. "Just because a bull has EPDs doesn't mean he is good." Brown said. The EPDs simply reflect how the bull compares to other bulls. Brown has never printed actual performance data in a bull catalog. No actual birth weight, no actual or adjusted weaning weight, etc. The EPDs provide much more information. Truck manufactures report the estimated highway and city miles per gallon. These numbers aren't always exact, but they provide a great estimate to compare different trucks. EPDs are the same for comparing bulls. Donnell Brown has been using selection indexes for 25 years. "If you are not successful, we are not successful" Sullivan says. We need to meet our customers need and produce beef for our consumers. Before you buy a bull, you need to identify herd goals. What are you looking to do? What are your selection priorities? You need to use the selection tools (indexes, EPDs, genomics). "Unless we know what we have, we can't sell it to you," Sullivan says. If a bull can't move and a bull can't walk, you can't use him. He won't be able to do what he is supposed to do. Bulls need to be structural sound. You need to look at the bull, or have someone trusted look at him. You need to find a reputable source of genetics (breeding stock). Santa Rosa Ranch stands behind every bull they sell. Do your homework. Is the seedstock producer doing what they say they are doing. You need to make a sound investment. They price their bulls at 5 times the current prices of the calf market. Some bulls are priced higher if they have potential to go into a seedstock herd. Don't look for the cheapest bull out there. Concentrate on factors that have the greatest effect on profitability. Performance is a function of both genetics and management. Don't single trait select. You're investing in their program and, if they are reputable, they are investing in your program as well. You must require a Breeding Soundness Exam (BSE) be performed before you take ownership of the bull. What development ration has been fed? Is he fat? If he is fat, he is going to lose a lot of that condition when he is out breeding cows. Disposition and docility is sometimes over looked. You don't want the problems associated with bad dispositions. "One of the goals of our program is moderating mature frame size," Sullivan said. "We need her to breed back and have a calf every year." Donnell prints only the most valuable information in the bull sale catalog. Brown's number 1 trait is $Profit. Everything that effects your profitability goes into that index. Percentile ranks helps producers better understand EPDs. If you can count from 1 to 100, you can understand percentile ranks. Is this bull average? In other words, 50th percentile. Is the bull in the top 5%? Is the bull in the 95th percentile? Maternal is so much more than milk. Is the cow going to have a calf year after year? "I measure as many things as I can measure," Brown said. "I like selling 18 month old bulls. I like having a man to do a man's job, rather than asking a boy (yearling bull) to do the job." "A bull you bought last year will effect your herd till 2034. 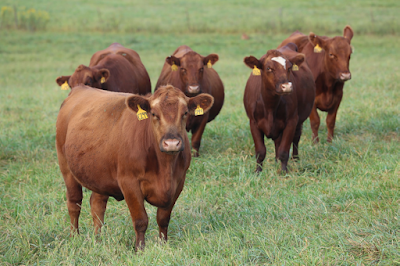 A bull you bought is an investment in your herd," Brown said. If you buy an old junker, clunker pick up, you get the performance of a junky pickup. The same thing happens with regards to the bull you buy. *Note, this post was live blogged and may contain errors.